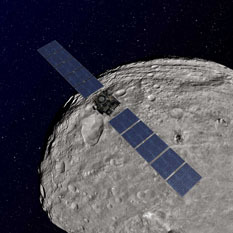 Traveling from one alien world to another, Dawn is reliably powering its way through the main asteroid belt with its ion propulsion system. 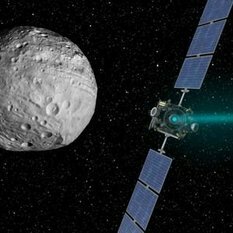 Vesta falls farther and farther behind as the spacecraft gently and patiently reshapes its orbit around the sun, aiming for a 2015 rendezvous with dwarf planet Ceres. Marc Rayman's latest Dawn Journal explains why Dawn is currently closer to the Sun than both Ceres and Vesta. Marc Rayman's latest Dawn journal explains the temperature adjustments engineers make to save power and keep the spacecraft warm. Now that Dawn has changed its speed by nearly eight kilometers per second, Marc Rayman revisits the concept of orbital velocity. 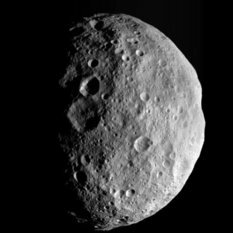 As Dawn continues thrusting toward Ceres, Marc takes a look back at the intrepid spacecraft's discoveries. As Dawn treks onward to Ceres, its path will cross within a few degrees of the moon as seen from Earth on Jan. 21–22.